ART TILES ON SALE -- Daisy Gannon, County Executive Mike Gannon and Rachel Parker display an art tile which will be on sale for $75.00 by Youth Dream. Schools and teachers struggle to provide everything students need for a quality education, even during good economic times. During tough economic times, which the country and Cannon County are currently experiencing, the challenge is especially tough. But you can help. Cannon County Youth Dream (CCYD) and local artist Rachel Parker are proud to present a limited edition art piece of Cannon County. With the priceless donation from Cannon County and the handy work of Rachel, the history of the county can be brought home. 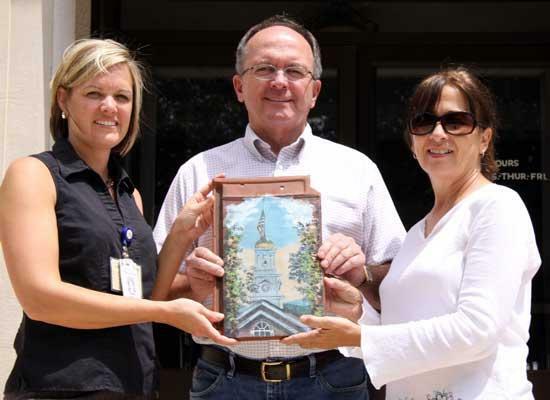 CCYD has paired the roof tile from Cannon County’s historic courthouse along with the local artistry of Ms. Parker to created a limited offer unique work of art. Proceeds from the sale of the artwork will be used by CCYD to provide teachers with much-need funding for supplies and educational tools at each of the county’s schools. CCYD also provides a scholarship to a senior boy and a senior girl each year based on need and volunteer work, Gannon said. The limited edition artwork is for sale on a first come, first serve basis for $75. Prints will be numbered by the artist. If specific numbering is requested there is a $25 additional charge (donation of CCYD). Each print features a historic piece of art, unique to Cannon County, secured onto a roof tile from the Cannon Courthouse. Each tile has been hand brushed and given hand painted details by Parker. The tile is approximately 14 x 9 inches. The tiles were donated by Cannon County, and come from the Cannon County Courthouse roof, which had to be repaired following a horrific hailstorm in April of 2006. “Everyone will remember the hailstorm for a long time, and the tiles are \a way of preserving a piece of our history,” Parker said. Parker is a longtime resident of Cannon Co. and is a self-taught artist. Her work can be found on the walls of many of the area schools, churches and businesses. Wall murals and baptisteries scenes can be found in commerical and residential venues throughout Middle Tennessee. Her painting of the Rutherford County Courthouse was chosen by popular vote and was purchased to hang in the restored courtroom. She has exhibited at many different venues including juried shows at Opryland Hotel. Portraits and landscapes of Cannon Co. has been her primary focus. The Cannon County Veterans Wall of Honor and “Lady Justice” in the Cannon Co. Courthouse are also among her local projects. Rachel feels that the CCYD project is a opportunity to showcase the beauty and history of Cannon Co. and provide funds for children’s educational needs. “There is no budget for arts classes in our schools. How do you teach art when you have no money?,” Parker said. The tiles are on sale at The Arts Center of Cannon County and First National Bank. Only 250 are available. For additional information contact CCYD at ccydream@gmail.com. CCYD is the Education Foundation for Cannon County Schools. The foundation is committed to providing extra funding for teachers for projects that enhance learning. The organization’s goal is to give the young people of Cannon County every opportunity to reach their full potential. Another fundraiser for CCYD is its yearly Cannon Blast 5k, which will be held on Sept. 26. Rachel Parker’s Art and Frame Shop is located at 365 Hoover Road and open by appointment by calling 615-563-4740.